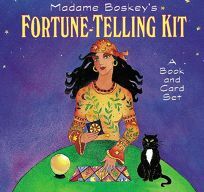 reading the future Modeled on Russian gypsy fortune-telling cards, Madame Boskey's Fortune Telling Kit: A Book and Card Set by Kirsten Hall and Amy Christensen, illus. by Dana Cooper, contains 48 updated images, among them a friendship bracelet, sneakers and a microphone. The images are formed by adjacent cards-each colorful square card bears four triangular half images rather than one full image-and the meaning of each image depends upon the direction it faces. Interpretations should spark late-night revelations at many a slumber party.